Plastic gears are commonly used where weight, corrosion resistance and quietness of operation are required. They run without the need for lubrication, making them suitable for food and pharmaceutical industries. 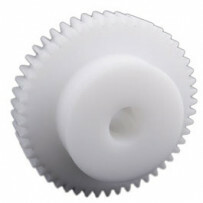 We supply plastic gears with milled teeth and a pressure angle of 20°.Our standard gears are made of material POM / Delrin. We provide different materials on client request. If you have any injection moulded request for bigger series, our engineering is happy to help you with your drawings and specifications.